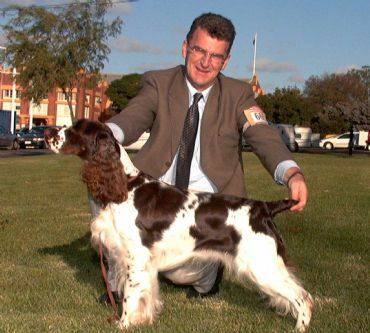 Producer of typey, sound Champion stock and line bred to Gr Ch Kinsheran Rich Pickings, Veni is herself a Specialty Challenge winner. We were pleased that she was able to assist Trevor & Sonia Webb (Amblespring ESS) with their breeding program in South Australia. From 2 litters Veni produced 4 Champions. When put to her grandfather Rich Pickings she produced Ch Kinsheran Nigella & Ch Kinsheran Mandella. When put to Ch Clanach Imperialist she produced Ch Amblespring Ralph Lauren & Ch Amblespring Coco Chanel.